The retailer has rebounded from a terrible 2014 but still faces plenty of challenges. Department-store retailer J.C. Penney (NYSE:JCP) has gone through one of the toughest periods of any company in its industry in recent years. After watching its stock plunge from 2012 to 2014, shareholders have seen the discount retailer finally appear to hit bottom, and 2015 has brought a much-needed rebound for long-term investors in the company's shares. Some encouraging signs have led investors to be more optimistic about Penney's prospects than they were this time last year, but the retailer still has plenty of work to do to turn itself around fully, especially as longtime rival Macy's (NYSE:M) and other department-store retailers deal with challenges of their own. Let's take a closer look at how J.C. Penney has picked up the pace in 2015 and whether that momentum will continue. 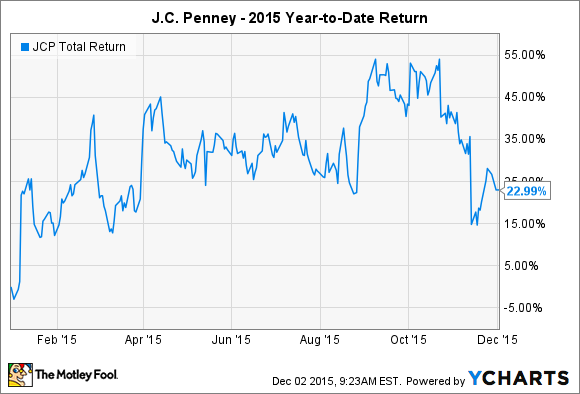 What has happened to J.C. Penney in 2015? J.C. Penney's financial performance has been somewhat mixed during 2015, but that in itself has been an improvement over poorer conditions throughout much of the past several years. During the first half of the year, Penney posted substantial gains largely by proving to investors that its 2014 holiday-season results wouldn't be as bad as many had initially feared, with comparable-store sales eventually weighing in at 4.4% for the fiscal fourth quarter as the company celebrated a $1.1 billion increase in operating earnings for the full year and positive free cash flow. Investors also took heart in an encouraging leadership change at the top. New CEO Marvin Ellison took over, following through on his emphasis on omnichannel development in order to drive a new customer demographic and get mobile-shopping customers into stores by working toward same-day in-store pickup capability. Ellison identified key areas like kids' clothing and home furnishings where Penney could work harder to squeeze more sales productivity from the business, and common-sense moves like separating the men's and women's shoe areas have shown early signs of producing a nice payoff for the retailer. Penney's second-half financial results were similarly encouraging. In the fiscal second quarter, revenue growth beat expectations on a 4.1% rise in comps, driven largely by its partnership with in-store boutique operator Sephora. The third quarter included a net loss for Penney, but comp growth accelerated to 6.4%, and a combination of higher gross margins and dramatically reduced overhead expenses helped keep the red ink under control. That stood in stark contrast to Macy's, which saw its stock fall sharply after reporting discouraging results going into the holiday season. Indeed, Macy's is far from the only retailer feeling the pinch toward the end of the year, with many of the companies that both J.C. Penney and Macy's consider to be rivals facing challenges of their own. JCP Total Return Price data by YCharts. Coming into the holiday season, J.C. Penney remains confident. The company recently announced its plans to focus on maintaining adequate inventories of high-quality merchandise. By doing so, it hopes to avoid past mistakes in which shoppers couldn't find in-demand goods to buy. Ellison also sees Penney shoppers as being in good economic shape and being better able to afford more generous gift-giving for the season. As you can see above, the obvious problem that J.C. Penney still has is that it hasn't returned to profitability on a GAAP basis. Encouraging progress on the adjusted-earnings front has kept shareholders satisfied for now, but restructuring charges continue to weigh against the bottom line, and Penney's hefty debt load is costing the company more than $400 million per year in interest expense. It's not unusual for a stock to start moving higher before a full turnaround takes shape, and Penney investors are right to give the company credit for the progress it has made. Nevertheless, Penney needs to keep working harder in 2016 to deliver on its full potential and give shareholders the results that they're counting on to drive further share-price gains in the future.